One of the main struggles we hear is that the general public is ignorant of what we do as architects. If people don’t know what we do, how will they ever value our services? How can we better educate and share our purpose with the world and, in doing so, increase that perceived value of the profession throughout the world. This week, Mark R. LePage talks with an architect based in New York City and Hong Kong, the founder of a thriving architecture and design firm who has found a way to educate society on the value of architecture one child at a time. 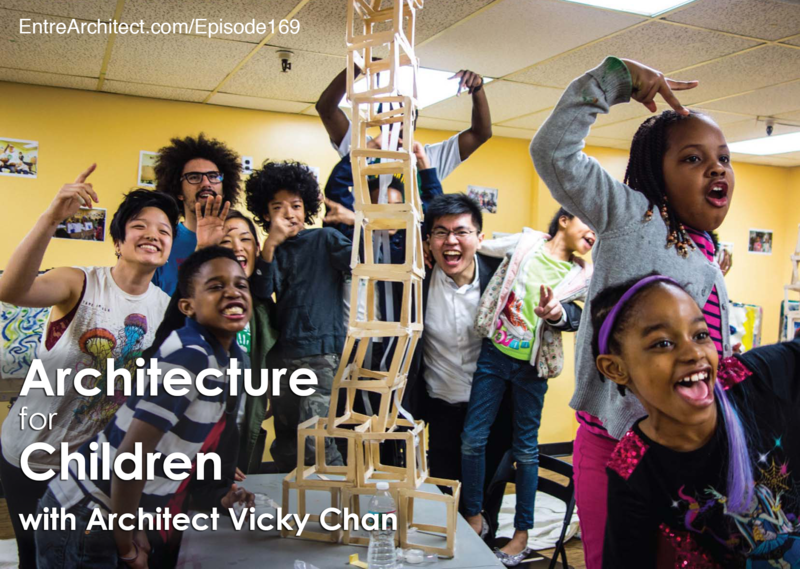 This week on EntreArchitect podcast, Architecture for Children with Vicky Chan. Vicky is the founder of Avoid Obvious Architects, with offices in New York and Hong Kong. The firm specializes in sustainable design for buildings and cities with a focus on combining art and green technology. 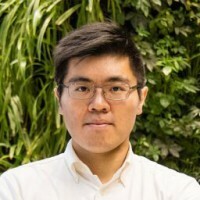 He also founded a volunteering organization called Architecture for Children, teaching over 3,000 children about sustainable design and architecture. Vicky grew up in Hong Kong and his family moved to New York about 20 years ago. He always loved art and science, and didn’t immediately realize that architecture was the perfect combination of the two. Throughout his academic studies, he decided to pursue architecture. After graduation, he worked at a large architecture firm, in one season working over 100 hours in a week. He decided then to get out and do something different and fund his own ideas. Along with wanting the freedom to choose his clients, Vicky began pursuing more sustainable design. Having his own business allowed him to take time out of his week to go to the local school and teach children about architecture. Vicky knows that most kids won’t become architects, but he hopes to influence society toward green design. When the kids that he’s teaching grow up, perhaps they’ll retain the knowledge they received from him and use it to make decisions on their future homes. Through teaching children, Vicky has had many opportunities to refocus his values. He also works with special needs children, and, while other children tend to want to design things from their favorite movies or cartoons, the children with special needs want to design hospitals to help others. He learns a lot from the children. In addition to finding meaning through teaching, Vicky has also found encouragement for more innovative thinking. Instead of getting fancy and complicated, what about looking at design through the innocent lens of a child’s eyes? What if the crazy ideas that kids have actually come to fruition in the near future? When Vicky was in college, he was invited into a program where he went to a local school and teach them math and English. Soon, he was encouraged to do a side project in teaching children about architecture. After that, he realized how difficult it was to teach architecture to children. He worked to refine the idea so that the children could come out with a keyword or key concept. To come up with something simple that the children can complete in a short period of time has helped him a ton with his own design. Finding the simplicity in it make it easier to understand. Vicky also learns from different cultures when teaching children in both New York and Hong Kong. In general, kids in New York are exposed to more art and are more imaginative and creative, whereas the children in Hong Kong are more practical. He works to encourage the children to fail and try things they aren’t sure of so they can learn from what doesn’t work. How often do you teach? Vicky teaches with three local schools up to twice a week. He also has volunteers who study architecture, design, marketing and math, and each comes in and teaches their field to the children. They work mostly with kids after school. How have you seen children’s innocence influence your work? One child proposed that when a wind turbine she was designing was not in use, they could turn it into a ceiling fan. Though that’s not possible, it made Vicky think about dual-purpose design. Additionally, one child told them that they wanted a hole in the middle of their roof so that they could open it in the middle of the night and see the stars. Vicky presented the idea in a similar way in one of his other projects. What’s some advice you can give someone who may want to start a program of their own? When Vicky first moved here, he had no connections. He set up a page on his website and printed some booklets and sent it out to various schools. The best advice he can give is to reach out to your community. It’s not hard to tell a school that you want to teach their kids for free! Since they’re a non-profit, they have to be very conservative with their materials. For necessary supplies things like pencils and scissors, they found a company that donates supplies for educational purposes. Last, come up with something that the children will remember. Their attention span is so short that it’s hard to keep them focused, but, many times, Vicky holds competitions to motivate the kids to finish well. Often 6 – 12 years old. On the older edge is his primary focus, but he teaches anywhere in that range. Where did the name “Avoid Obvious” come from? Since their architecture firm was fairly young, they wanted to shake things up and tell people that they were more than capable. Instead of naming it after someone’s last name or something standard like that, they openly encourage potential clients to do things out of the normal and “avoid the obvious”. Unfortunately, the phrasing doesn’t translate perfectly to his Hong Kong clientele. Are you considering a rebrand? Not presently. They work to rebrand following ABC; A for architecture, B for branding, and C for children. They’re working to get their name out there and create a presence. 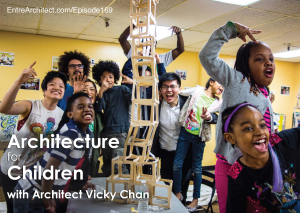 Connect with Vicky about online at AOArchitect.us or via Facebook for Avoid Obvious and Architecture for Children. EntreArchitect Academy is a digital program and private online community of architects working together to build a better profession. Learn more at EntreArchitect.com.